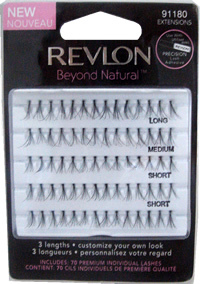 Revlon Beyond Natural EXTENSIONS (91180) Premium Individual Lash Clusters effortlessly enhance your look! Get gorgeous, natural-looking lashes with customizable individual lashes in THREE (3) varying lengths. Easy to use. Good Buy. eyes look, because I have short, non-curling lashes so these make my eyes pop!